Valsugana: Where Castles, Wild Rugged Mountains, Art and Nature Meet. The Valsugana (Suganertal in German; Valzegu in the language of the Mocheni; see above an image of verdant fields and mountains taken from Carzano, in the valley's central section) is a wide corridor in south-eastern Trentino, bordering with the provinces of Vicenza and Belluno; it has a mostly west to east development. The term 'Valsugana' derives from the Latin Vallis Ausuganea – that is, "valley of Ausugum", which is the ancient name of the town of Borgo, still today the main centre of the valley. To the south, it is delimited by the Altopiano di Asiago and the high plateaus of Luserna, Lavarone and Folgaria; to the north it is bound by the long Lagorai chain and the Tesino plateau. Its westernmost extremity almost reaches the city of Trento – the provincial capital and one of the most important centres in the Alps – separated by the wide corridor of the Adige valley only by a low string of hills. Quite differently, to the east the Valsugana becomes narrower, and it runs almost carved among steep mountainsides between the Altopiano di Asiago to the west and Monte Grappa (1,775 m) to the east. As is often the case in the Dolomites’ region, this section takes the name of ‘Canale di Brenta’, after which the river then flows into the Venetian plain, by the important town of Bassano del Grappa. The geography of the valley is dominated by the river Brenta, which originates from the lakes of Levico and Caldonazzo, then proceeds with an easterly direction to finally drain into the Adriatic sea. The Fersina stream is also quite important, as it flows through the town of Pergine and then merges into the Adige by the city of Trento. The basin of the Brenta is separated from the Fersina by the low pass of Sella di Pergine (482 m). From an orographic point of view, the valley is enclosed by two mountain chains: the Lagorai range to the north, which separates the Valsugana from the Val di Fiemme, while to the south is the Cima Dodici-Ortigara (2,105 m) system, which divides it from the province of Vicenza. 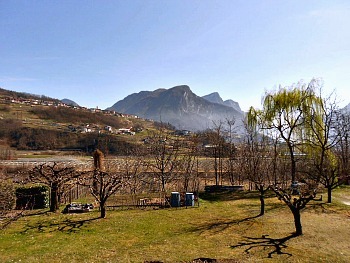 Among the side valleys are worth reminding the Valle dei Mocheni (see below), the Val di Sella and the Tesino plateau. The lower valley, in particular, is karstic in nature and therefore rich in caves – such as the ‘Grotta dell'Ernesto’ in Grigno, the ‘Grotta del Calieron’, the ‘Grotta della Bigonda’ and the ‘Grotta dell’Orso’/‘Grotta di Castello’, both in Castello Tesino. 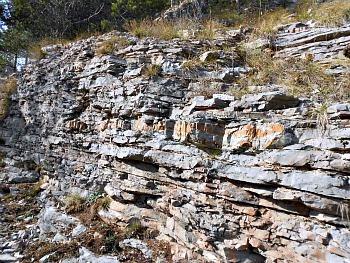 In Levico Terme flows an acidic water rich in iron – hence the town is quite renowned as a spa resort (see an image, below, of rock formations on the path to the atmospheric ruins of Castellalto, near Telve in the Central Valsugana). In Montesei di Serso, in the vicinity of Pergine, was discovered a settlement dating to the 5th century and belonging to the Reti – an ancient population stationed in the south-eastern Alps. At the time of the Roman Empire, along the Valsugana ran the Via Claudia Augusta Altinate, an important Roman road that linked the port of Altino on the Adriatic coast with the German city of Augsburg; remains of this ancient road can still be seen near Strigno and Pergine. During the Middle Ages the area was dominated by the Langobards of the Duchy of Trento – of whose presence there is some evidence – and the Francs; then it was contended between the Counts of Tyrol and the Prince Bishops of Trento. The small community of the Mocheni – of German origins – is also still present in the Valle dei Mocheni (see below). After the Middle Ages, the eastern section of the valley fell under the rule of the Republic of Venice. The strategic role of the Valsugana is evident, given the presence of an elevated number of castles, some of which have reached us in good conditions – such as Castel Pergine, Castel Telvana and Castel Ivano. From the age of the castles still many legends and stories remain, such as the one on the mythical figure of the Salvanel, who was said to live in a cave on the Doss Vivano, near Virago. In more recent times, the Valsugana was plagued by tension at the end of the Third War of Independence (1866), at a time when Veneto became Italian while Trentino was to remain under the rule of the Austrian-Hungarian Empire; the boundary between the two states was then fixed at Martincelli, a locality of Grigno. At the end of WW1 (during which several fights took place in the valley) the whole of Trentino eventually became Italian, but the boundary between the two provinces of Trento and Vicenza remained fixed in the same place. As a testimony of the broad impact of WW1 over the valley there is still the presence of several military forts, amongst which Forte Vezzena, Forte San Biagio, Forte Tenna and Forte Belvedere di Lavarone are the best known (and also those in better conditions). 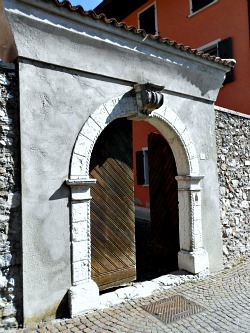 There are also many towns and villages, in the Valsugana, deserving a visit for their noble or vernacular architecture; for example, below see an image of the entrance to a nobleman's 'palazzetto' ("small palace") in the pleasant town centre of Telve, in the middle section of the valley. The valley is crossed in its entirety by the National road connecting Trento with Bassano del Grappa. Minor roads provide links between the Valsugana and other valleys (such as towards the Valle di Fiemme through Passo Manghen, 2,047 m, and the plateaus to the south). There is also a railway line that connects Trento with Bassano; the stretch between Trento and Borgo is organized like a light suburban rail, with frequent runs. Along the central section of the valley there is an interesting cycle route too, known as “Ciclopista della Valsugana”. It has been created through the union of different stretches of cycle paths previously organized by the single municipalities; by now it has become an important infrastructure that runs without interruptions between Pergine and Primolano (this route is flat and pleasant, and it can also be done for short stretches only, as bikes can be taken on the trains). From an administrative point of view, the valley is divided into two “Comunità di valle” – the intermediate levels, in Trentino, between the province and the different municipalities. These two communities are the Comunità Alta Valsugana/Bernstol in the western section and the Comunità Valsugana/Tesino in the eastern section. The Valle dei Mòcheni (Bersntol in the local language; Fersental in German) is also known as Valle del Fèrsina and is a valley in the province of Trento which is completely crossed by the Fersina stream, in the stretch from its springs to Pergine. The area is best known for the presence of a linguistic island of Medieval origin in which a language of Germanic origin is still spoken to this day. The valley is surrounded by mountains which are still relatively un-spoilt, especially on the westernmost fringes of the Lagorai range. The whole area is rich in meadows and woodland – in particular of larch and spruce. The main mountains which encircle the valley are Monte Ruioch (2,432 m), Cima Sette Selle (2,394 m), Monte Gronlait (2,383 m), Monte Fravort (2,347 m), Sasso Rotto (2,305 m), Pizzo Alto (2,264 m), Cima Cagnon (2,235 m) and Dosso di Costalta (1,955 m), which divides the Pinè plateau from the Valle dei Mocheni. The Valle dei Mocheni is composed of the four municipalities of Fierozzo, Frassilongo, Palù del Fersina and Sant'Orsola Terme, plus a section of the territories of Pergine and Vignola-Falesina; its upper reaches are inhabited by the Mocheni, while the southwestern section of the valley is Italian. Its economy is quintessentially agricultural; particularly renowned is the cultivation of soft fruits, which was developed quite extensively over the last 20 years. Out of all possible places, however, there is certainly one location that I would advise not to miss when visiting the area: Arte Sella is an international outdoor exhibition of Contemporary Art set up in 1986 in the open fields and woodlands of the Sella Valley (Val di Sella; a side valley just south of the town of Borgo Valsugana), which makes for quite a unique feature not just in the context of the Valsugana, but within the whole Alpine range – and perhaps even nationwide (in the picture above, an installation by the area of Malga Costa, the main entrance to Arte Sella's exhibition area). Arte Sella is both a highly-qualified exhibition of artistic works and, most importantly, the expression of an ongoing creative process in which art works are actually being followed as they grow and evolve. The artists who exhibit here are called upon to express a respectful relationship with Nature and treat it as a source of inspiration. 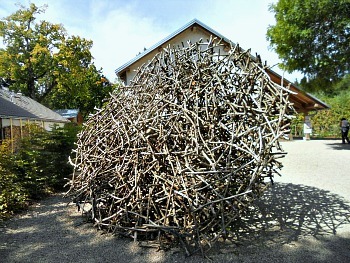 The works are usually three-dimensional and created in situ using stones, leaves, branches and tree trunks. Man-made objects, materials and colours are rarely used. All works are invariably placed outdoors and can be admired while enjoying the different natural settings – such as various types of woods, stones and monumental trees in the surroundings. 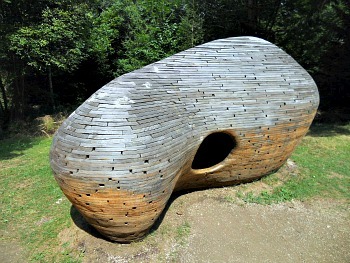 Each year, when the exhibition closes the artworks are left there to decay, thus becoming part of nature's life cycle again (in the picture below, 'Rifugio/Shelter', by Anton Schaller).